Wide-format print specialist Mimaki has moved to further enhance its range of solutions with the launch of the new CF22-1225 flatbed cutting plotter. With the ability to handle materials as large as 1,220 x 2,440mm, Mimaki said the device is the “ideal complement” to the Mimaki JFX200-2513 UV LED flatbed printer for users to produce seasonal point-of-purchase displays of exhibition components. Mimaki also said that both the CF22-1225 and JFX200-2513 can be combined with ArtiosCAD Designer Solution software to make a “complete print-and-cut workflow”, capable of creating custom packaging or prototypes. Ronald Van den Broek, general manager sales at Mimaki Europe, said: “We have brought to bear our extensive knowledge of cutting solutions in the development of the new CF22-1225 cutting table. 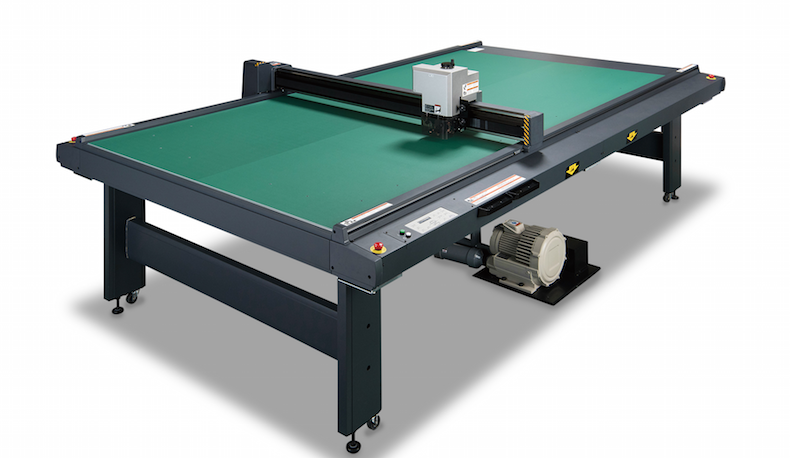 “Combined with the JFX200-2513 flatbed UV inkjet printer and ArtiosCAD, this offering is an ideal end-to-end solution for cutting and creasing coated cardboard, as well as reciprocating cutting of foam material used for packing. “In addition, Mimaki UV LED inks can print on a variety of materials, including uncoated substrates, with vibrant full-colour results. “Whether organisations are developing sophisticated short-run signs and display graphics, creating packaging mock-ups or samples, handling special requests for small lot furniture, or simply creating and producing designs on demand, this solution will not disappoint. The manufacturer has also highlighted how the Mimaki RasterLink RIP software can support production on the CF22-1225. RasterLink6 plus software, the latest version of the product, has an ID Cut function to help speed up printing and cutting, with the additional ability to include a barcode on the print. A crop mark sensor on the CF22-1225 can read this barcode, enabling the device to identify cutting and rotation information, which in turn allows for automation of the cutting process. Other features on the new RasterLink6 plus software include the FineCut plug-in for Adobe Illustrator, as well as a range of selectable cutting tools to support production on a host of industrial materials with a thickness of up to 55mm, such as acrylic, foam and rubber. Mimaki anticipates that the new CF22-1225 will be made available to purchase before the end of the year.